Essentially England News - Get Ready ... Get Set ... Go! Is it summer where you are? Congratulations! Enjoy it on our behalf, will you? Though with this mix of sunshine and showers and the humidity, our garden is a veritable jungle. That aside, we had a wonderful week in Norfolk. We haven't been for a while and it was really nice to be back. Asparagus and strawberries on tap, quirky history to explore and tiny lanes without traffic for riding tandem without a care in the world. 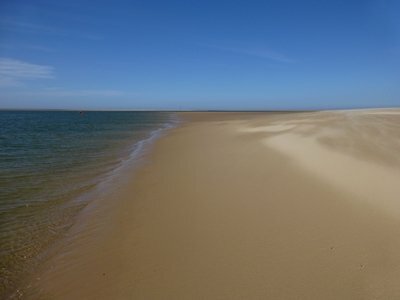 Norfolk is a marvel. Case in point: How's that for a beach? The start of the 2012 Olympic Games is only a couple of weeks away. 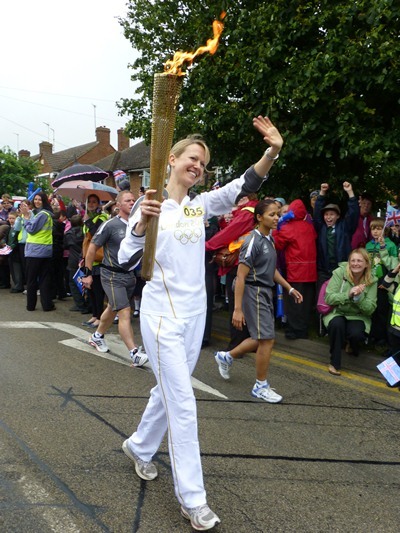 The Olympic torch is making its way around the country. And I'm discovering bits of Olympic history that I never knew about. I did know that various part of England have their own versions of "Olimpick Games", like the infamous Cotswold Olimpicks, where contests like shin kicking and pig racing are on the agenda of events. But I did not know that Baron Pierre de Coubertin, the father of the modern Olympic Games, gained his inspiration from the Olympic Games instituted in 1850 by Dr William Penny Brookes in the little English village of Much Wenlock. I did not know that the Wenlock games have been held almost every year since 1860 or that one of the mascots of the 2012 Olympics is called Wenlock in honour of Much Wenlock and Dr Penny Brookes. And I also did not know that the idea of the paralympic games was born in 1948 just down the road from where we now live, in Buckingham. What started as a small gathering of British World War II veterans has turned into one of the largest international sporting events - something we can all marvel about and be proud of! Did you know? Three cheers to you if you did! And if you're in England this summer, why not add Buckingham and Much Wenlock to your list of places to visit. At the very least, it's in keeping with the Olympic spirit. Finding English food and ingredients seems to be high on everyone's list - which the hobby cook in me can totally understand. I'm very grateful to everyone who contributed and shared their favourite places to shop. 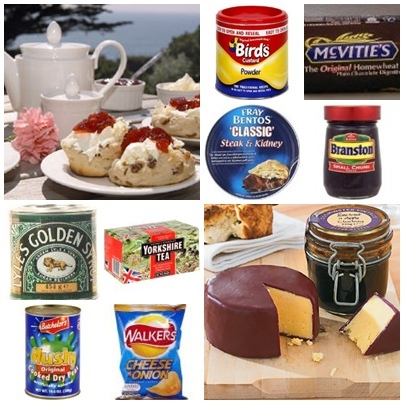 And so, now, we have a page dedicated to buying English food abroad. There's lots of good information here already, but I would very much like this page to be a work in progress. So if you find a shop that stocks all your favourite foods and ingredients and is worth recommending - please share your discovery with us! We'll all be very grateful. The second most common query in my inbox is about bringing electrical goods to England. Most of these queries are from readers in North America, who don't just have to contend with different shaped plugs and sockets, but are also used to completely different voltage supplies. For all of you, I have explored that topic and various solutions in this English travel tips squidoo lens. And finally, I know it's only July, but Christmas seems just around the corner when you're planning on surprising the family with handmade Christmas stockings. If you haven't started yours yet, check out this page on felt Christmas stockings and a more comprehensive list on handmade Christmas stockings. We always seem to complain about our English summer. It's too wet, too hot, too humid... I'm sure you get the picture. But though we might not enjoy the weather, not one of us ever gets tired of enjoying ice cream. This mint tea ice cream is quick to whip up, only needs four hours in the freezer and goes marvellously with ripe strawberries. Worth trying out! Make the tea first, so it has time to cool. You can use tea bags or fresh mint leaves, but the flavour needs to sing through loud and clear. Find a shallow dish that will fit in your freezer. Separate the eggs. Beat the yolks with the icing sugar until pale and fluffy. Whip the cream until thick, but not stiff. Fold into the egg mix, then carefully stir in the tea. Beat the egg whites until stiff and fold into the ice cream mix. Fill the shallow dish and freeze for four hours. Serve on the lawn, with a large bowl of strawberries. And an umbrella.